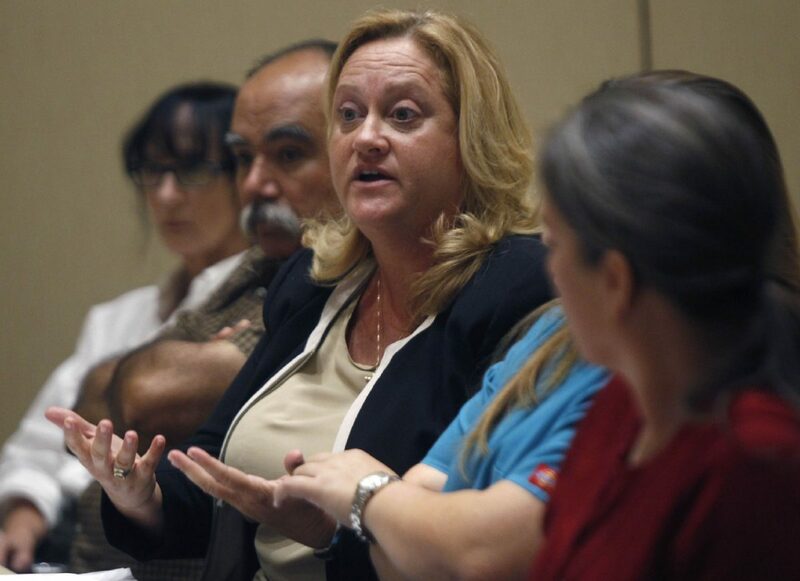 Dr. Norma Jean Farley speaks during a Sept. 28, 2015 meeting at the Edinburg Conference Center. She testified Wednesday during the Monica Melissa Patterson capital murder trial in Edinburg. EDINBURG — Hidalgo County’s chief forensic pathologist testified Wednesday that the man Monica Melissa Patterson is accused of murdering was suffocated. Dr. Norma Jean Farley said she determined that, in her medical opinion, Martin Knell Sr. died of asphyxiation by suffocation. It was testimony that supports the prosecution’s case, alleging that Patterson, 50, murdered Knell on Jan. 28, 2015, in order to gain control of his estate. 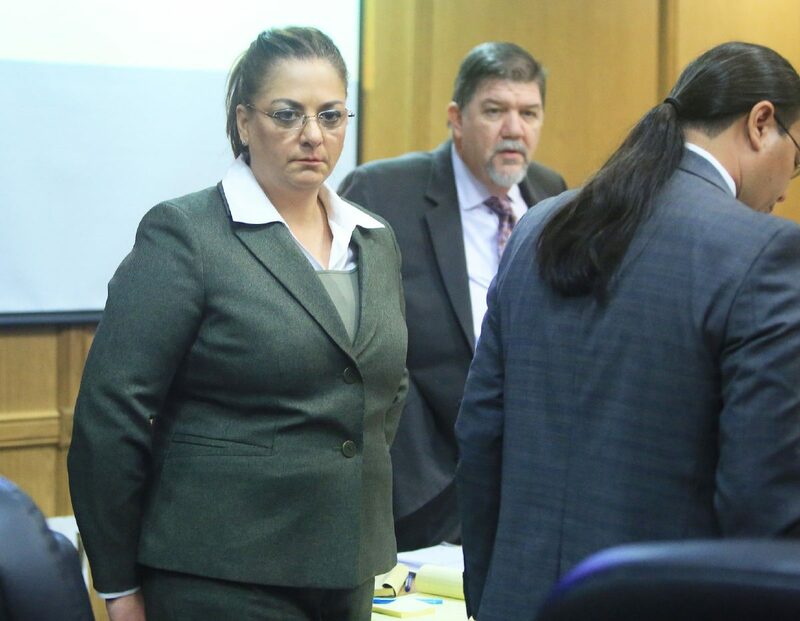 Celestina Mascorro, Knell’s caregiver and the sole witness of the events in question that day, previously told jurors she heard Patterson’s co-conspirator, Angel Mario Garza, “smother” Knell while Patterson waited outside. While Patterson’s defense team decided not to cross-examine Farley Wednesday, they still had an opportunity to question her. Margarito Trujillo, Comfort House board member, looks over Comfort House business documents with prosecuting attorney Joseph Orendain during the Monica Melissa Patterson capital murder trial in the 370th state District Court at the Hidalgo County Courthouse on Oct. 25, 2017, in Edinburg. Monica Melissa Patterson watches as the jury enters the courtroom during her capital murder trial in the 370th state District Court at the Hidalgo County Courthouse on Oct. 25, 2017, in Edinburg. Outside the presence of the jury and before she testified, defense attorney O. Rene Flores challenged Farley’s conclusion of how Knell died. Flores argued that Farley’s opinion was “not reliable” as it relied too heavily on information provided by the investigating agencies, including Garza’s post-arrest confession to suffocating the 96-year-old victim with a plastic bag. If Garza’s statement was taken “out of the equation,” Flores argued that Knell’s death may have been ruled as undetermined given that he suffered from “comorbidities,” including heart disease and cancer. Farley, who said she has performed more than 4,000 autopsies over her career, countered that gathering “investigative information” is a standard procedure in forensic pathology. In this specific case, the information included Knell’s medical records, investigation reports from the Texas Rangers and the Hidalgo County Sheriff’s Office, as well as statements made by Mascorro and Garza. “I cannot leave the investigative information out,” she said, explaining that it often reveals what otherwise wouldn’t be seen during an autopsy, such as suffocation by a plastic bag. The judge ultimately ruled that Farley could not reference statements made by Garza in her testimony before the jurors. The autopsy report also had to be redacted to remove these references. Despite as much, Farley was adamant that Knell had died not from sudden cardiac arrest, as the defense alleges, but stood by her findings that he died by asphyxiation likely caused using a soft object. She noted that Knell’s body also showed no signs of a heart attack nor that his death had been a result of his multiple myeloma. When it comes time for the defense to call their witnesses to the stand, it is expected that they will call a medical expert to challenge Farley’s testimony. The prosecution switched gears after Farley’s testimony, moving from Patterson’s capital murder charge to the counts of theft and misapplication of a fiduciary she also faces, and which stem from her role as the former administrator of Comfort House. 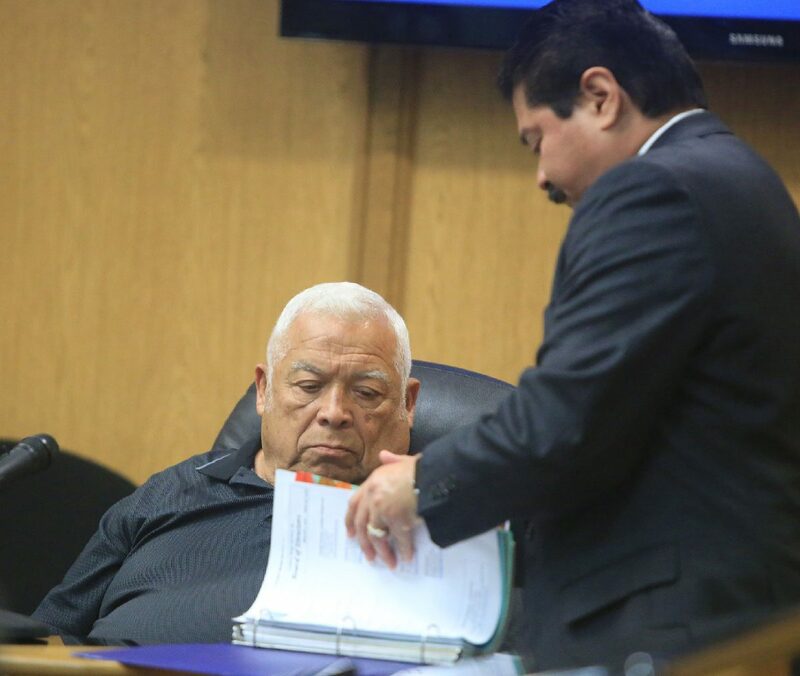 Margarito Trujillo, a current board member of the McAllen nonprofit hospice center, told jurors that former board member Dori Contreras had pushed for Patterson to be hired. Her hiring date remains unclear, though it was likely in late 2013 or early 2014. Contreras has served as a justice of the 13th Court of Appeals since 2002 and is running for the chief justice position in 2018. Both Contreras and Trujillo served on the board together, but the former resigned following Patterson’s arrest. At one point, Trujillo said Contreras had “admonished” him “to go ahead and go with the flow” when he raised concerns about board meeting minutes Patterson had prepared. This was said outside the presence of the jury, however. Before the jury, Trujillo said that after the board became aware of unauthorized expenses made by the administrator in the wake of Patterson’s August 2015 arrest, Contreras and a few other board members decided to sign a civil nondisclosure agreement with the defendant. He testified that he had asked to see it, which was denied, and thus saw the agreement for the first time when he took the witness stand Wednesday. As per the agreement, in the “event that Patterson fully reimburses Comfort House” for disputed expenses, both parties agreed not to pursue legal action against one another. Patterson, in turn, paid the nonprofit $70,000 through Kittleman Thomas PLLC, the law firm where Ray Thomas was a partner. Thomas is also running for chief justice of the 13th Court of Appeals. Omar Guevara, the Comfort House board president at the time of the signing of the agreement, previously testified that Thomas helped draft and oversee the agreement. Guevara also told jurors that the internal audit he conducted placed the disputed expenses at approximately $86,600, and Trujillo testified that, to his knowledge, Patterson had not fully reimbursed the nonprofit for this amount. “If we settle for the amount, and the amount that is missing is more than that, it’s like giving a hot check to somebody,” Trujillo said of the $70,000 paid by Patterson. During his cross-examination of Trujillo, defense attorney Ricardo “Rick” Salinas brought up a civil suit Knell’s son filed in probate court against Patterson, Comfort House and three Comfort House board members, including Trujillo. Contreras and Guevara are not named in the lawsuit. Trujillo testified that he felt betrayed by Contreras and Guevara since they resigned from the board after the defendant’s arrest. “I’m there for the mission and purpose of Comfort House regardless,” he said of why he remained on the board. Trujillo also testified that he loaned the nonprofit $25,000 after Patterson’s arrest so it could remain in operation. The prosecution, which is nearing the end of its witness list, has yet to rest its case against Patterson.